If you’re a regular reader or follower you’ll know how much I love my wall art. I have a Pinterest board dedicated to it, and have written many posts about it both here and on other brand sites. It’s one of my passions and something that makes a house a home for me. When Zazzle asked me to collaborate with them on a project I was thrilled to discover we could create something unique and personal for my walls. 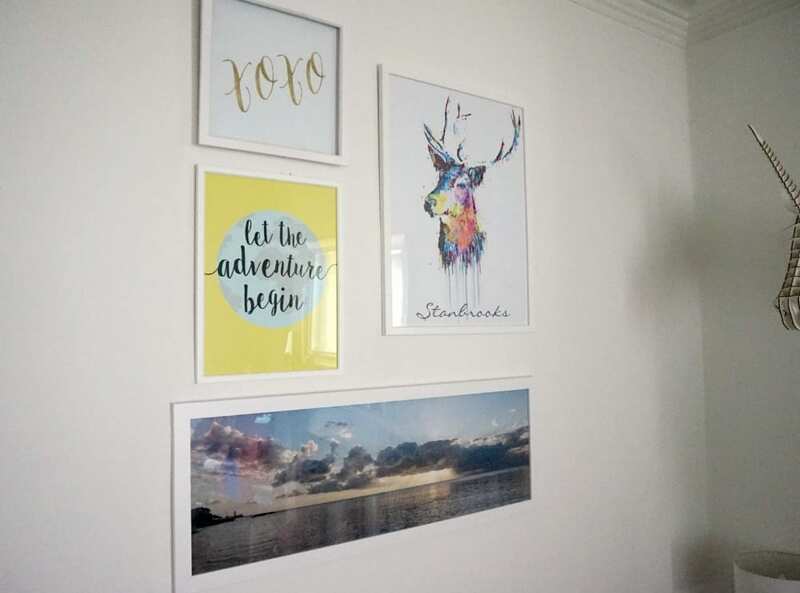 So in this post I’m going to show you how to use the Zazzle website to customise their products before you buy, and how to create a very cool little wall gallery feature. The Zazzle marketplace is huge, so I’d recommend having an idea on what you’re after before you start searching. After a little browsing I’d decided on customising some poster prints from this section here. And I knew I wanted them to be personal to us, and be colourful to co-ordinate with our lounge decor. Blues, yellows, purples with lots of white space would look best. Holidays and travel have been particularly important to us in the last few years so this one was perfect. Except it needed a little colour for my scheme. This is how it looked on the initial screen. The Zazzle platform easily lets you customise most artwork, so it was simple to change the background colour to yellow so it worked better with my colour choices. You might like it plain or simple, or you could add your own colour. I just love the pop of colour which will tie into my existing decor. I’m not sure what it was about this print that caught my eye, but something did! Using the editing features, I enlarged the text and moved it slightly to give it a little personalisation. That’s what I love about Zazzle, you only need a little tweak sometimes to feel like you’ve stamped your mark on something. Oh when I saw this I just knew it was for me. The colours, the imagery, and the ability to add our family name in a cool and quirky way were perfect. I’ve been looking for something like this for a while and it just jumped out at me. And then hey presto, it updates the image with your chosen text. You can also change sizing on any of these posters so I made a little drawing or map to show how I might like to display them (and considered where I’d get the frames that wouldn’t cost too much either) before selecting the right sizes. We recently came back from a stunning holiday in Mauritius (you can read more about that here) and the trip was so memorable I wanted to put a favourite photograph up on the wall. This plain poster option enables you to upload your own image, and then crop and centre it to fit the size. I liked this elongated shape and thought it would sit well at the bottom of the collage. Adding my own image of this remarkeble sunset on the horizon was easy enough, simply wait for it to upload and then customise. If you’re looking for something interesting for the home that you can customise easily, do check out the Zazzle website and marketplace, and be prepared to lose hours of your time browsing. There’s absolutely something for everyone. Exactly what I’ve been looking for, we’re finally into decorating our flat after doing a lot of work on it but I’ve been umming and ahhhing over what prints we should buy and what photos we should use. I really want to create some wall art in a couple of rooms in our house but I’m slightly cared to make a start in case I get it wrong! This looks so cool! I love that you can choose a design and then customise the colours – I often find prints or quotes I like, but the colours aren’t quite right for the existing decor. Oh I absolutely love this. These would make perfect gifts. Lovely Jen – i keep meaning to finish my travel themed hallway, great inspiration for that here! Really love your choices here Jen. I got a plan to use Zazzle too, must sort that soon, just not had chance. oh WOW! This looks like SUCH a cool site. I am a big fan of wall art too and always struggle to find things that are quite right. Definitely going to try this site. Ace post Jen! Zazzle is indeed a great editing tool and quite affordable too. 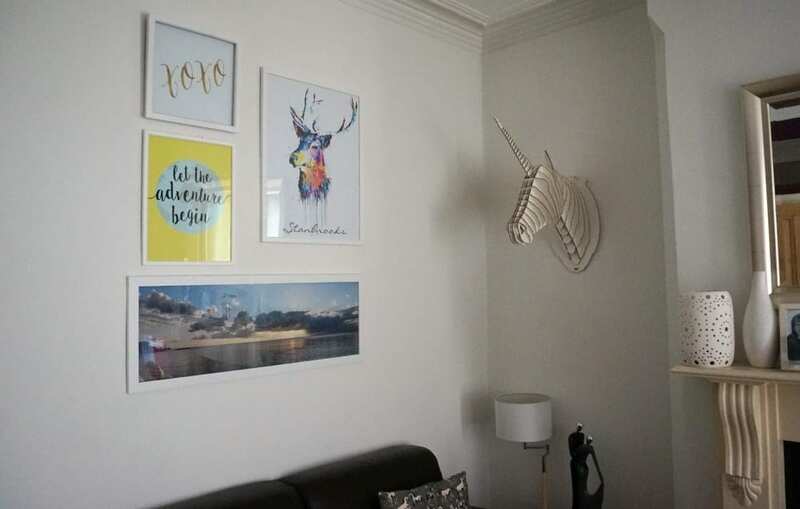 However, I’m more interested in the unicorn on your wall. Is it custom made you bought it from somewhere?